Oregon leads the conference in scoring (45.6 points per game), rushing yards (216.0 yards per) and total offense (503.6). The Huskies are allowing 13.7 points per game and have a streak of 50 games of without allowing more than 35 points. 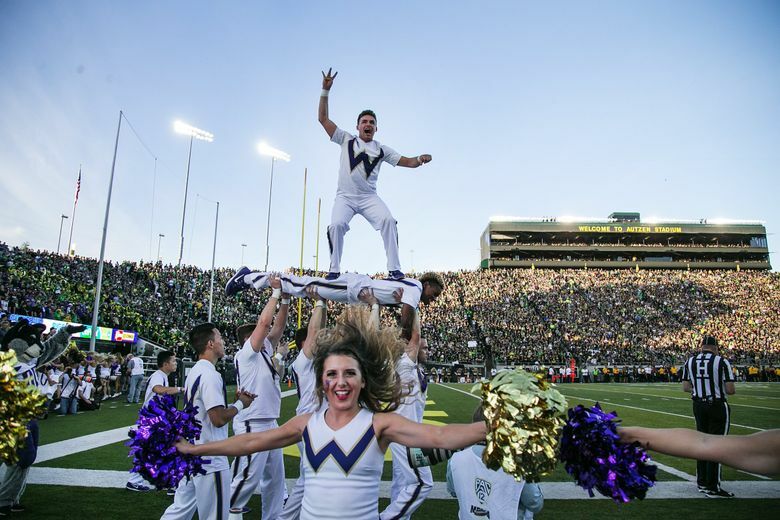 In a top-20 matchup that could go a long way toward deciding the Pac-12 North title, Washington will bring the Pac-12’s No. 1 scoring defense to Eugene on Saturday to square off against the most potent offense in the conference. The No. 17 Ducks (4-1, 1-1 Pac-12) haven’t quite returned to their glory days under Chip Kelly, but they’re not far off. Oregon leads the conference in scoring (45.6 points per game), rushing yards (216.0 yards per) and total offense (503.6), behind a quarterback, Justin Herbert, who leads the conference in efficiency rating (180.9). “There is not as much of the stuff left from the Chip era. It’s still a really dynamic offense, but they’re doing stuff a little different, using more pistol and that kind of stuff,” UW senior linebacker Ben Burr-Kirven said. Kelly’s new team, UCLA, gave the Huskies fits on Saturday in the Rose Bowl. The No. 7 Huskies (5-1, 3-0) held on for a closer-than-expected 31-24 victory over a winless UCLA team, but not before the UW defense allowed a season high in points (24) and yards (422). UCLA converted seven of its 10 third-down plays in the second half against the Huskies, who didn’t register a single sack against the Bruins. Washington has just eight sacks in six games — third-fewest in the conference. UW co-defensive coordinator Jimmy Lake reiterated Tuesday that he’s not overly concerned about the Huskies’ third-down issues. (“I am worried about every single down,” he said.) For him, the bottom line is the Huskies are leading the Pac-12 in scoring defense for the fourth consecutive season. Washington has a streak of 50 games without allowing more than 35 points in a game. By comparison, the second-longest such streak in the Pac-12 belongs to Utah — at 10 games. “We’re playing really sound football,” Burr-Kirven said. “Obviously we’ve had some third-down struggles, not enough turnovers and not enough sacks, but I think at the end of the day we’re winning games. We’re not giving up points. It’s funny, after the UCLA game, we give up 20-something points and everyone’s frustrated. But then you look around college football and most defenses are giving up 35, 40 points a game; if they give up 20, they’re pretty happy. The Huskies believe they have the Pac-12’s best and loudest home-field advantage at Husky Stadium. Oregon’s Autzen Stadium is renowned as one of the most hostile venues in the conference, too. And it will be an especially hostile welcome for the hated Huskies on Saturday afternoon. Three weeks ago, after Stanford rallied for an improbable overtime victory over the Ducks in Eugene, video showed fans in the Autzen stands throwing bottles and debris at Stanford players exiting the field. On Tuesday, Oregon athletic director Rob Mullens addressed an email to Ducks fans. The Huskies believe playing against Auburn in Atlanta and against Utah in Salt Lake City has prepared them for a difficult road environment.